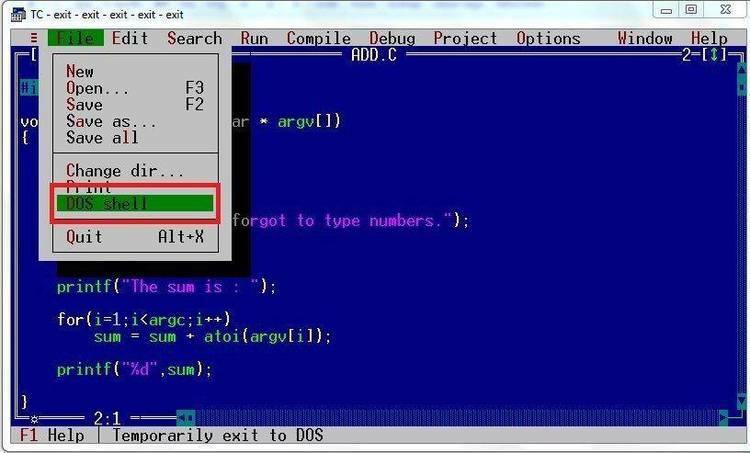 Command line argument expansion (like Unix) for Turbo C.
Put argv in lower case. default command-line processing with a more Un*x-like version. the argument array passed to the main() function. command-line wild cards, so the program just sees a list of file names. Command-line wildcard handling isn't 'seen' by the programmer at all. job. Minor differences will be mentioned. See the enclosed program X.C which simply prints its arguments. probably be a result of a memory allocation error. t,s,c,m,l,h) must be linked in BEFORE the standard turbo libraries. Link like normal, put ARGVx before the Cx library. Just mention ARGVx.lib in your project file. Here's specifically what happens to the command line you've typed in. and a null string is there instead. A token is a sequence of characters followed by a separator. be preceeded by a backslash (\). For example, here's how the following line is separated into tokens. hi mom "how are" you doing" "today? "\"I'm fine\""
inserted in the list unchanged. from the start of the token to the last occurance of ':', '\' or '/'. expanded names. I prefer lower case. followed by other non-whitespace characters. For the command line argument: when"in"the"course"
separators, I consider it one. X.C Example program, prints its argv. "right out of the box" or change it to suit your tastes or fix bugs. makefile uses Microsoft MASM 4.0 and Lattice's OML librarian. Microsoft's LIB can be substituted for OML by changing the makefile. this case. Simply recompile EXPAND.C and replace it in the library. on the tcc command line (-D...) to change the operation of the package. compilation if you'll be doing any of this "by hand". variables __argv and __argc, which don't exist in 1.5. I'm VERY interested in any feedback, bugs, suggestions.